Congratulations on finishing the final Term of the year! This post will fill our rising Second Years in on what Library resources, both print and online, will be available to you during summer break. The key point to consider when using library databases is to avoid the transfer of entire reports, articles, or data content from academically licensed databases to your summer employer. Transferring database content to a summer employer breaches our license with the vendor; and could cost the breaching user, and all of Fuqua, their access to the database. Using databases to prepare for your internship without the transfer of content may be permissible. Please review the examples of appropriate and inappropriate use described on our web site; and email us if you have any questions. Leaving North Carolina for all or most of the summer? Don’t forget to return library items before you leave town. Why? If the book you borrowed is recalled for use by another patron, you’ll need to ship it back to Ford Library. If you aren’t able to ship it back, you should know that recall fines are $3/day. If you are borrowing a Kindle, you do get a guaranteed 4 week loan, but they can’t be renewed after that. Audiobooks are just 2 week loans. Thank you for returning library materials before you leave! Osnos, Evan. Age of ambition : chasing fortune, truth, and faith in the new China. Farrar, Straus and Giroux, 2014. One week from today, a group of 104 Fuqua students will depart from Durham for Fuqua’s China GATE, a unique opportunity for an academic/cultural experience in Asia’s vibrant superpower. Among the group are Fuqua staff members Chris Shull (Accounting) and world traveler Linda McCormick from the Ford Library. Everyone who signed up for the trip has been preparing for months. And the Ford Library helped, by purchasing a collection of books that can help voyagers get the most out of their experience. 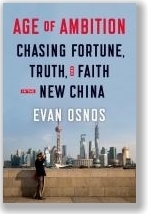 One of the best new books is Age of Ambition by Evan Osnos, Beijing correspondent for The New Yorker from 2008-13 and resident of China since 2005. He has been observing the profound changes in everyday life for Chinese people resulting from the sweeping transformation in the economic sector. Osnos uses the stories of everyday people to explain how life for the average Chinese person is changing. Central to the story is the Chinese Communist Party, ruling the world’s largest authoritarian state for over 65 years. Forty years ago, an individual had no choice in where to live or what to do for work; whom to marry or how many children to bear. People had no opportunity to build a business or to travel outside of China. When all of this began to change beginning in the 1980’s, tremendous risks and opportunities were created. People began to imagine a better life for themselves. They took steps to realize their aspirations. Ambition was no longer a negative quality. Osnos uses irony as he observes the inconsistencies that come with rapid change. Chinese culture is deeply influenced by the group and the ideas of freedom and individuality take time to assimilate. A favorite portrait in the book is a young woman who leaves her village for better opportunities in the city. She begins a successful online dating website, a revolutionary idea as the traditional way to find a spouse is through the services of a village matchmaker. The goal of her business to avoid the pitfalls of matchmaking, and to offer to young clients a personal choice in potential mates. Yet the entrepreneur becomes known as “China’s No. 1 Matchmaker.” Her company is called Beautiful Destiny, while the idea of destiny is the antithesis of choice. While the Party supports the economic progress that new freedoms have provided, it is reluctant to accommodate liberty as a potential threat to its survival. Censorship and propaganda are two tools used to retain power yet in the age of the internet, ordinary people are connected in new ways, making it difficult to control information. And as Chinese people prosper, they want to know more about the world around them. This remarkable book is recommended for most readers. If you are going on the China GATE trip, the insights in The Age of Ambition will bring more meaning to your personal observations. And if you are staying in the U.S., the book is a readable sojourn into one of the most fascinating countries on the globe. This book is also available as an eBook on OverDrive as well as on the Business Best Seller Kindles in the Ford Library. Bon voyage and take care. Wishing you the trip of a lifetime. Library fines got you down? Post a selfie taken in the Ford Library to our Facebook page and we will waive one of your overdue fines* during each Friday of the time period. Fine Forgiveness Fridays begin this Friday, April 17th and ends on Friday, May 8th. FYI- If you don’t feel comfortable posting your image on our Facebook page, feel free to be creative. You just need to post a picture that you have taken in the library that infers that you were present. How you do that is up to you. *Fine forgiveness will be applied to one Ford overdue fine incurred in the last 6 months (Nov. 2014 – April 2015). Forgiveness does not apply to fines incurred from recalled items, items that have not yet been returned, or for fines that were incurred for items owned by Duke University Libraries other than the Ford Library. *This waive would be in addition to the once per year regular one-time waive for overdue materials that is already available to any Ford patrons. Maximum of 4 total fine waives is possible since the event will last through four consecutive Fridays. You must post one eligible picture per waive. For any questions contact ford-library-circulation@fuqua.duke.edu. Book Review: Marissa Mayer and the fight to save Yahoo! Carlson, Nicholas. Marissa Mayer and the fight to save Yahoo! Twelve, 2015. Also available as a downloadable audiobook, eBook, and on Kindle. In the late 1990’s Yahoo was the place to work in Silicon Valley. Yahoo attracted the best engineers. The corporate culture was friendly, innovative and irreverent. For customers, Yahoo was an easy to use interactive platform for email, chat rooms, shopping, travel and games. For most users, Yahoo was the internet. But in 2000, Yahoo’s good fortune began to change as advertising revenues declined and competition with startups like Google intensified. Leadership changes designed to turn Yahoo into a next generation media company failed. Frequent CEO changes produced additional corporate mistakes and missed opportunities. In 2012 Marissa Mayer was hired from Google to end the long period of decline by transforming the company. In Marissa Mayer and the Fight to Save Yahoo!, business journalist Nicholas Carlson tells the complicated story of Yahoo and its famous CEO. After graduating from Stanford in 1999, Mayer accepts a position at Google as a coder to surround herself with smart people who would challenge her to grow. Less than a year later, Mayer finds her niche, guiding the development of Google’s user interface and setting the agenda on the products that Google would make. Like many others at Google, Mayer is smart and ambitious. Some say she takes credit for the work of others. She is confident, dismissive, self-promoting and insensitive to the feelings of others. But so are many other technology company icons, such as Bill Gates, Steve Jobs and Mark Zuckerberg and their behavior does not generate the same resentment. In 2011 Mayer conflicts openly with other executives and is removed from the top spot at Google Search, the company’s most important product, and is moved to Google Maps. She decides to leave. When Mayer gets to Yahoo in 2012 the company is in bad shape. The firm does not have a clear identity: Is Yahoo a media company or an internet products company? Revenues are declining. Employees are demoralized by layoffs and unmotivated due to lack of strategic direction. Mayer is tough and intense, taking the lead on product reviews. To improve transparency, she sets up weekly town meetings with Yahoo employees. She replaces company leadership, not always successfully. Despite her efforts, she has yet to engineer a turnaround. Fortunately, Yahoo has a strong presence in Asia, including a stake in Alibaba, which generates a fortune in cash when the Chinese e-commerce company goes public in 2014. Marissa Mayer and the Fight to Save Yahoo! contains an unflattering portrait of Roy Bostock, Yahoo chairman 2008-12. Bostock has been a member of the Fuqua Board of Visitors and Duke Board of Trustees. He and his wife Merilee are also generous donors to the university and in appreciation, Duke’s Bostock Library is named after them. This book is recommended.